So, this was our week for the quarterly bulk trash collection. Those things are always fascinating for various reasons. First off, I’ve never understood why the City of Austin tries to keep them so secret, e.g. not publishing them on the city’s website somewhere. I think I remember reading one time that they were trying to prevent ‘scavengers’ from coming around to take the stuff. But quite honestly, that doesn’t make a lick of sense. If somebody wants it, can get some use out of it, and – most importantly – is taking it my off hands, who cares? And speaking of those ‘scavengers,’ I just love that little army of pickup trucks with flatbed trailers that combs its way through the neighborhood on the Sunday when the collection week starts. What exactly do they do with the stuff they collect? Perhaps it makes its way to some garage sale somewhere. Again, props to them for making a silk purse out of a sow’s ear as far as I’m concerned. It’s also really interesting to see the neighbor’s detritus heaped up on the front lawn. It’s almost like an archeological dig, minus the rooting around. Sometimes, it’s pretty easy to see why something’s made it to the rubbish tip. I mean, what self-respecting 10-year-old girl wants to be seen in last year’s Disney Princesses wading pool? And certainly no need to explain the salmon-and-turquoise palm frond settee sitting by the curb. Nobody wants their house to look like the set of ‘The Golden Girls.’ But some cast offs are just inexplicable. For example, one of my neighbors actually discarded this phenomenal lawn ornament. Can you imagine?!? I sure as heck wasn’t going to let this get snatched up! Luckily, there was no moon the night I liberated it from the trash pile, so probably wasn’t seen. And now back to the old toilet seat… A couple of months ago, we replaced the toilet seat in the master bathroom. Not sure what came over us – I guess some mad money in our pockets and a caprice, but there you are. So now we’ve got this old toilet seat. I generally like to stock up on replacements of important items, you know, in case something breaks, but a redundant toilet seat seems a bit like overkill, so we just decided to trash it. Problem is, it doesn’t fit in the trash can. 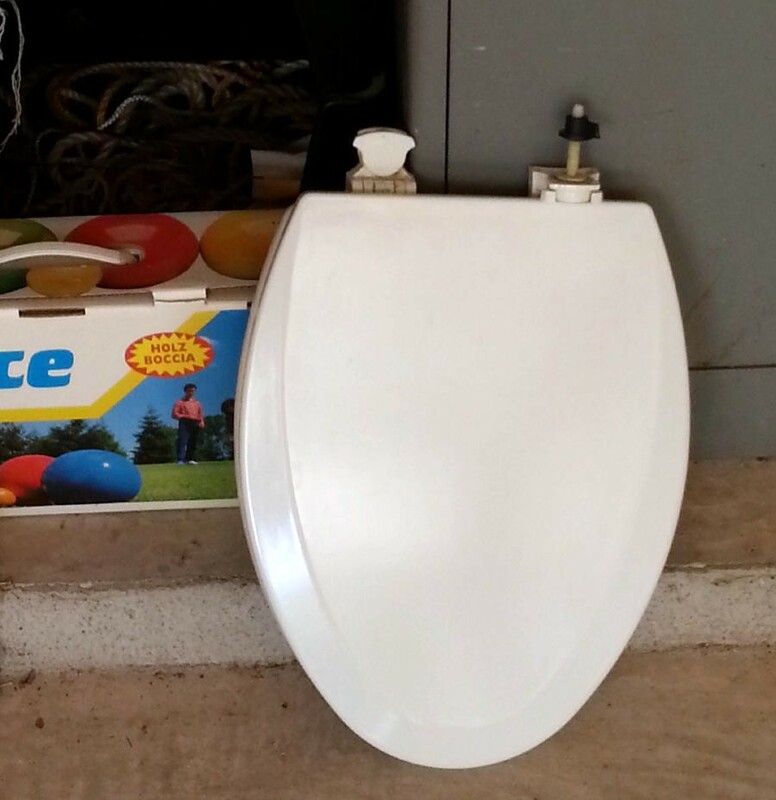 Now my dilemma…do I put the old toilet seat out with the rest of the bulk trash? I’m generally pretty picky about what I put out. I’d like the neighbors to think we have classy trash. I mean, who doesn’t, right? Also lurking in the back of my mind is this: will the scavengers actually take an old toilet seat? It’s amazing how much the scavenger’s opinion of my trash has actually come to matter to me. Every quarter, it’s the same thing – I haul my treasures out to the curb and watch from the window for the scavengers to come and evaluate. It pains me when something isn’t snatched up immediately. “I cannot BELIEVE they didn’t take that old barbeque!!! Sure, the bottom’s rusted completely out, but the top is pristine! What were they thinking?! ?” So the week has progressed and I’m still plagued – do I put out the old toilet seat or not?